Toronto-based Weathsimple’s new ‘Trade’ app is now available to all Canadians. The mobile app, available on iOS and Android, allows users to buy and sell thousands of Canadian- and U.S.-listed stocks and ETFs. The best part? No commissions on trades. Wealthsimple Trade hopes to make stocks more accessible to everyone. Along with $0 commissions on trades, Trade has no minimum account size — you can start trading with just $1 in your account — and it’s easy to set up. 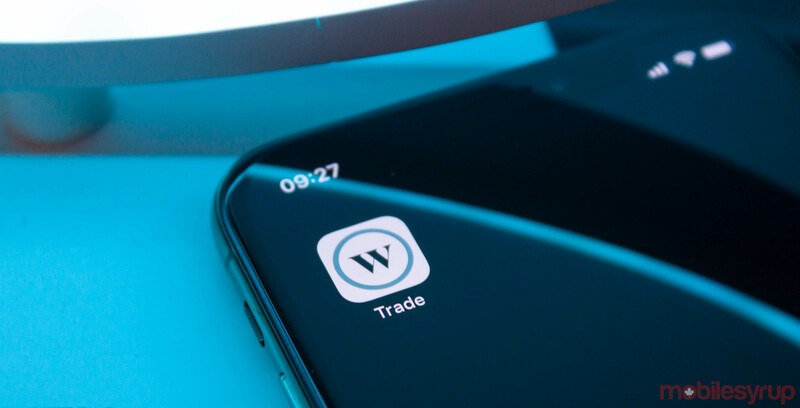 The company says new users will need to take a few minutes to create their account, but existing Wealthsimple clients can sign up for Trade with a single tap. In reality, it’s more than just one tap — it took me about five to sign up for Trade — but five taps to start trading stocks is a lot less than most other methods. It’s also worth noting that it can take some time to begin trading with the app. You’ll need to move funds to Trade, which can take three to five business days. Additionally, Wealthsimple says the app will continue to improve over time based on feedback from clients. At launch, Trade offers unlimited, commission-free trades, no account minimum, fast order execution, market and limit orders and personal (unregistered) accounts. There’s also a watchlist feature to monitor stocks without buying them. Wealthsimple first announced Trade in August 2018, and over 130,000 Canadians signed up to test the app before launch. More than 7,000 people piloted Wealthsimple Trade and provided feedback on the experience. You can download Trade from the App Store or Google Play for free.